Des Williams got a $15 parking fine despite having time left on the meter. 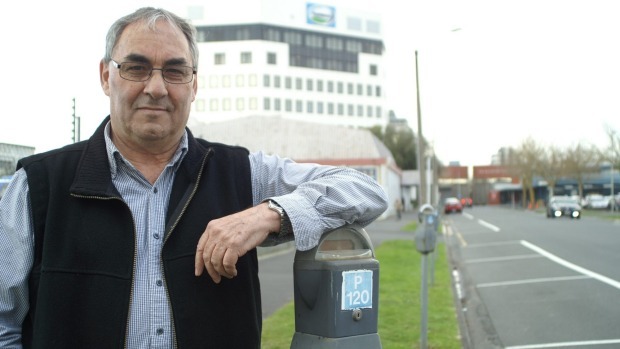 The Hamilton man says council needs to better publicise its time-limit rules. He fed the meter, but Des Williams still got pinged for parking. And the same could happen to you if you ever reach the time limit and just move your car a few parks along, or even top up your meter and stay in the same spot. That's against the rules, says Hamilton City Council, as that behaviour shuts out shoppers and visitors in the central business district. This photo of the street was taken about 10 minutes after Des Williams got his ticket. On Friday, Williams picked a 120-minute spot near his work on the edge of the town centre and was topping his meter up every two hours. But he wasn't moving his car. And that's why, on on his third top-up trip and with six minutes left on the meter, he found a parking warden giving him a ticket. Williams says he was told he had to move his car off the stretch of Harwood Street to avoid falling further foul of traffic bylaws. He took the "senseless $15 fine" and moved his car around the corner. "I've been parking [in Harwood Street] for 10 years and I've been topping up the meter like everybody does - you trot out and put your money in the meter and you top it up - thinking that's quite acceptable. But according to [the warden's] interpretation, I can't do that. I've got to move away from the zone," he said. "How come it's taken me 10 years to find out about it? "If that is council's law, the way they interpret it, then they need to do some publicity about it so I'm not the only mug who gets landed with this." The parking time limits are all about making sure shoppers and visitors can get easy access to town, a council spokesman said. "In the CBD, on-street metered parking is for a maximum of two hours to encourage vehicle turnover," city transport manager Jason Harrison said in a statement. "After that time, under our bylaw, the car should be moved to another zone or be away from the park for at least 20 minutes." Generally, moving to another zone means moving to a different street. "The zones are marked by the arrows on parking signage, but in general, different streets will be in different zones, as are areas with different time restrictions," parking compliance supervisor Shannon Brisco said. But Williams didn't buy the turnover argument because he took a snap of the street about 10 minutes after the ticket was issued and it was mostly empty. "It's hard to know what to make of it. "If there were 20 people waiting for me to move out so they could move in, you could understand some logic to it," he said. "If Hamilton had a CBD like other cities, where people are always looking for a park, yeah, that's fine. But we're a long way away from the CBD [in Harwood Street]. We're 10 minutes' walk away." Though he's frustrated, he says he'll hand the money over - with a letter to council. "I don't care about the money. I can pay the $15. It's the bloody illogic of it all." Commuters should be looking to city parking buildings or off-street parking options made for longer-term stays, the council said. "Short-term parking is installed at high turnover areas to allow shoppers and visitors the chance to access the central city, rather than for commuter parking," Harrison said. Hamilton's parking rules are governed by the Land Transport Act and the city's bylaws, and the time limits for on-street parking are displayed on signs beside them. Anyone who wants to appeal a parking ticket can write to Hamilton City Council. Do you think the fine is fair? Support your opinion with evidence from the article, or a relevant experience from your own life. Identify and describe two habits of mind Des used when responding to this parking ticket. Describe at least two benefits of the council charging for parking spaces. Describe at least two drawbacks of the council charing for parking spaces.